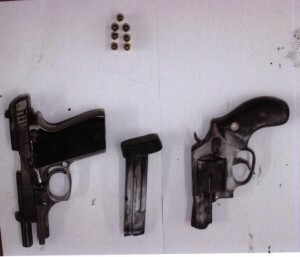 Guns and ammunition found by police during their probe into the murder of Ryan Sargeant outside Rio Inn. Homicide Detectives assigned to the Rio Inn Night Club incident, Friday morning searched a house at Hadfield Street, Lodge. Two unlicensed handguns (.32 pistol and a .38 revolver along with fifteen (15) rounds of ammunition were found, police added. Three persons, inclusive of two females have been taken into custody and are assisting with the investigation. Additionally, relative of the said investigation, two males suspects have been arrested Friday morning at separate location. 18- year old Ryan Sargeant was last Monday gunned down outside Rio Inn at Forshaw and Oronoque Streets, stemming from an argument inside the night club.